Three quarters of the way through the twentieth century the woodland surrounding Thenford House had seen little attention since Queen Victoria’s day. The garden immediately around the house had, however, been cared for and the two acre walled garden had continued in active use until after the Second World War, although by the 1970s its use was largely given over to the rearing of lambs secure from the foxes for which the Bicester Hunt was famed. Michael and Anne Heseltine purchased the house and its surrounding garden in 1976, whilst adding over 400 acres of agricultural land to the horticultural and agricultural assets of Haymarket Media Group. Over the next twenty five years their priority consisted in the restoration of 40 acres of woodland. The debris was cleared, rotten or fallen trees replaced, the walled garden brought back to its former use, the medieval fish ponds – much altered in the nineteenth century – dredged and the water flow restored. The two acre lake had to be cleared of 3 metres of silt and its stone retaining wall rebuilt. In order to help with the replanting programme the Heseltines sought advice from some of the leading horticultural leaders of the time, including Lanning Roper, Sir Harold Hillier, Roy Lancaster and Keith Rushforth. The eighteenth century woodland had been grown for its commercial value. The Heseltines widened the choice of trees and shrubs and thus laid the foundations of the present collection. It was around the turn of the century and free of the responsibilities of the government that the Heseltines decided to create a range of ornamental features and seriously enhance the quality of the collection. 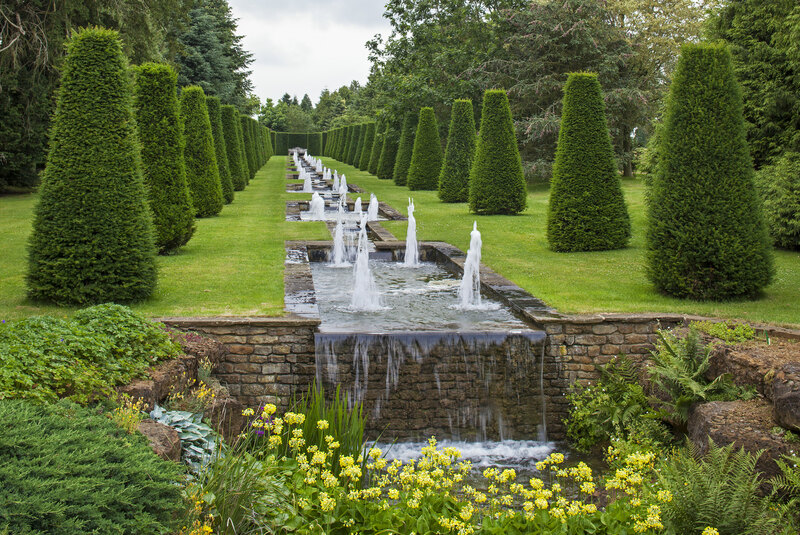 The arboretum, now spread out over seventy acres, features a collection of more than three thousand different trees and shrubs, together with extensive herbaceous borders, water gardens, an alpine trough garden, a sculpture garden, a rose garden and a rill. The medieval fish ponds, their interconnecting canal and the existing lake have been restored and two new ones have been added. An eighteenth century avenue of mature yews has been cleared of self seeded shrubs and saplings, and returned to its former grandeur. We are currently in the process of documenting the entire collection of trees and shrubs at Thenford. Click the link below to browse the current listing. The gardens are also open by prior arrangement to organised groups or individuals with a special interest in dendrology, horticulture and gardens.